Well, Trout in the Classroom is over again for another year and an estimated one thousand little trout fry have been released into the river! We set out on this odyssey in 2002 at Old Palace School in Croydon with the aim of having 20 schools annually at some time in the future. We reached that target in 2007 – 08, and maintained it again this year with schools in our London Boroughs of Croydon, Merton, Sutton and Wandsworth. 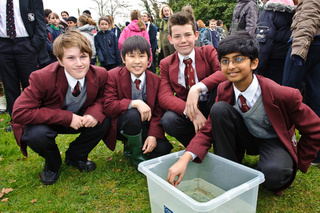 That the pupils were able to nurture their fry in their classroom hatcheries for another year, was largely thanks to the support of the Living Wandle project funded by Thames Water, and the massive amount of time and hard work put in by our dedicated volunteers, who were much more involved with the project than in previous years. 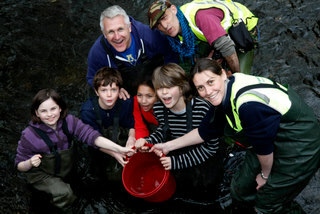 As planned, we held our releases on three dates, at three locations along the Wandle. All the signs are that our core educational project has been even more successful than last year, and reached more 9,000 local children. We also believe that our success rate in hatching more eggs and keeping the little alevins alive was boosted by the use of hatching nets for the first time. In late March I attended a twenty minute multi media event at the Parish Church Junior School in Croydon which emphasised exactly what this project is all about. The Year Four group had devised a show which included contemporary dance, music, a song which they had composed themselves and animated films which they had made. 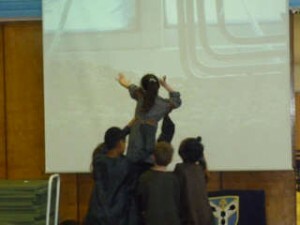 The performance was all about the birth of a baby trout and the importance of saving our environment. These eight and nine year olds performed with such belief and professionalism that I was truly moved, and I think I am well qualified to judge their quality having been a professional dancer myself. Thank you once again to all the teachers, pupils and volunteers who have put so much into the project this time round, and over the past six years too. 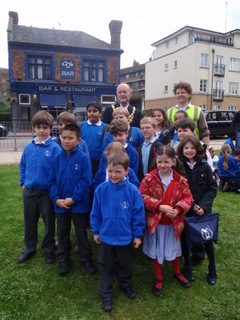 This entry was posted in Uncategorized and tagged Events, Trout in the Classroom, Wandle on April 10, 2009 by Gideon.